I had the good fortune to be asked to represent one of the UK’s national birding magazines ‘Birdwatching’ on a press trip to Southern Portugal earlier this month. Co-funded by two of the regional tourist boards, Alentejo and Algarve, we were led by one of the very best birders in Portugal João Jara who as well as running his own guiding business Birds and Nature, has served as Chairman of the Portuguese Rarities Committee and a is a thoroughly nice chap to boot. If you have been on the receiving end of any guided birding you know that a good guide can make or break the trip and João was up there with the best in terms of his knowledge of the local sites, breeding birds and visitors, coping easily with our constant questioning. The steady supply of high quality lunch destinations with superb local food on offer was also gratefully received. On the last day we headed towards the border with Spain to the west and the village of Barrancos. 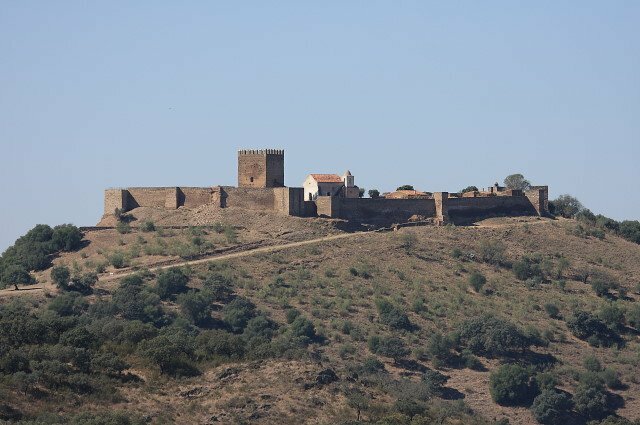 Whilst the village lies a few kilometres inside Portugal historical border skirmishes in the area have left the village with a sense of independence, so much so that the village welcome sign viewed as you leave reads ‘You are now entering Portugal’. Located in a vast area of small hills and open Holm Oak forest or montado habitat Barrancos is very different from the flat coastal areas of Portugal visited by most tourists. We were headed for the Noudar Nature Park, 9km from Barrancos along a dirt track; Noudar takes some effort to get there but is well worth the trip. In May 1992 European Union governments adopted legislation designed to protect the most seriously threatened habitats and species across Europe. This legislation is called the Habitats Directive and complements the Birds Directive adopted in 1979. At the heart of both these Directives is the creation of a network of sites called Natura 2000. A model in sustainable agriculture and tourism, Noudar is part of the Natura 2000 Network. 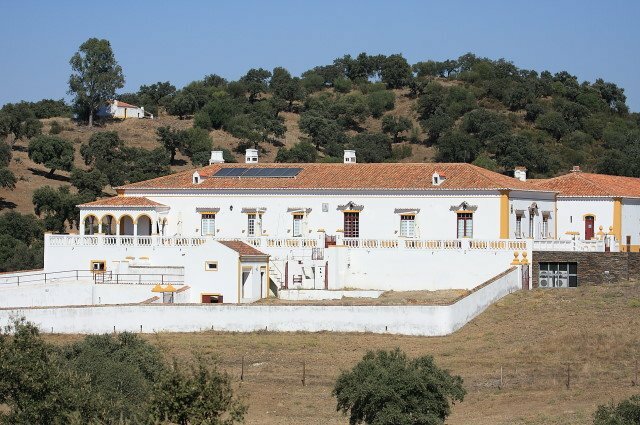 Arriving at the gleaming white walls of Coitadinha Homestead, the restored farmhouse that acts as visitor centre, accommodation, office and kitchen for the Noudar staff and visitors we were greeted by a small party of Crag Martins, flitting in and out the central courtyard. After introductions we took a short walk to test out the PDA based site tour guides that visitors can use to guide them along the myriad of forest trails. 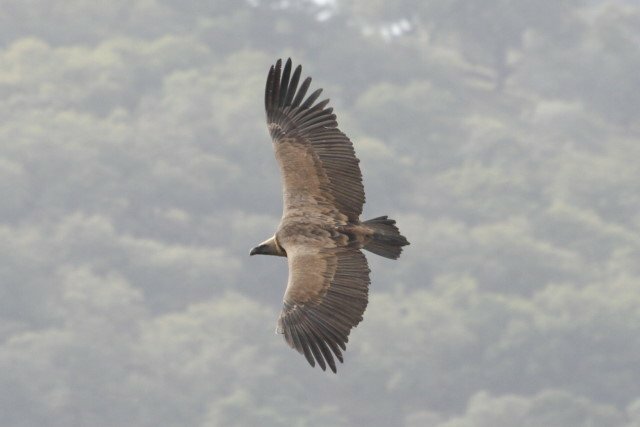 We quickly picked up a Red Kite from the verandah and a couple of Griffon Vultures circling in the distance. The air-conditioned accommodation is split into two buildings, one with a small number of double rooms and another with hostel style bunk bed accommodation though the latter has an incredible open modern communal room. Every room has great views. Noudar has recorded 184 different species since 1999. A visit in Spring will undoubtedly produce the best return of numbers of species when the area boasts some fantastic ‘summer visitors’ such as Roller, European Bee-eaters, Rufous Bush-Robins amongst many, many,others. The park may have been considered quiet whilst we were there but we still managed to pick out a Black Vulture amongst the soaring Griffons. Sardinian Warblers could still be glimpsed darting from bush to bush in the dry scrub and a late afternoon walk into one of the river valleys produced Little Egrets, Mistle Thrush, Song Thrush, Rock Sparrows, Green Sandpipers, Crag Martins and Red-rumped Swallows. 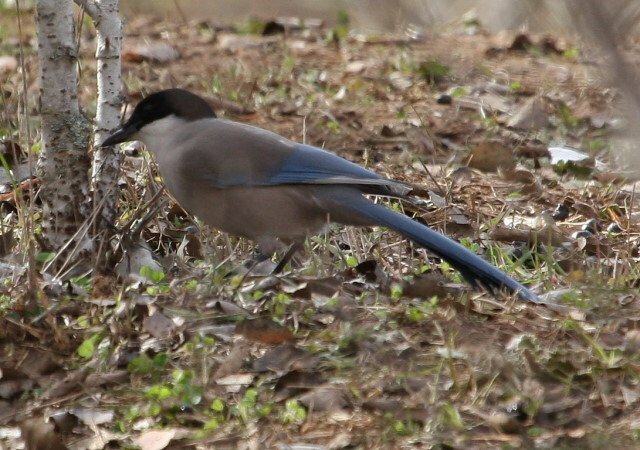 Southern Portugal generally is the best place in Europe to see Azure-winged Magpies and they too can be found amongst the montado at Noudar. For those interested in butterflies Noudar can be a fantastic destination with a diverse range of species such as Spanish Festoon, Rock Grayling and Lang’s Short-tailed Blue. We were lucky enough to witness spectacular numbers of the day-flying migrant moth Crimson Speckled as we arrived at Noudar Castle, 2.5km along mountain tracks from the Coitadinha Homestead. In fact I was so intent on photographing these fantastic looking moths that I nearly missed the best and rarest bird of the trip. Crouched in the castle compound trying to capture an Iphone image (and failing spectacularly) I heard a shout from the castle walls of White-rumped Swift. 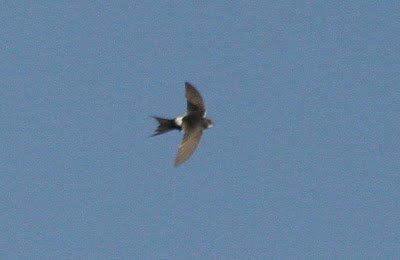 We knew from discussions with João that a few pairs of White-rumped Swift breed in Southern Portugal, in fact we had even visited a breeding site and been shown one of the feather adorned nests a few metres into an old mine entrance, but we didn’t expect to catch up with one thinking they may all have departed for their wintering areas. Leaving a trail of Crimson Speckled moths in my wake I ran up the ancient stone steps to view the valley below where only seconds below the swift had paraded. Ten minutes later I was still swift-less and beginning to feel dejected, a further 10 minutes and I had stoically resigned myself to missing the best bird of the week and one of Noudar’s star visitors. Suddenly a shout from the castle turret and fellow Brit birder Stephen Menzie had picked up the swift again, this time it danced above our heads for what seemed an age as time stood still and we drank in the big white throat and petrel like wrap-around rump. Big grins all round as we headed back to the electric all terrain vehicles available to Noudar’s visitors for covering the 1000+ hectares of the park. Noudar is a superb destination with some great birds with an amazing backdrop, well worth spending some time exploring. You really can’t get much more ‘away from it all’ the only real downside is that it’s so far away from it all getting there as an independent traveller without a car is tricky. Take a car, spend a week, do the culture, enjoy the food and some great birding, let me know how you get on. This is terrific, Alan. Portugal’s birding attractions don’t get enough coverage, at least around here! What a wonderful place! I visited the Algarve many years ago, before I became a birder. It was one of the most lovely places I’ve ever spent time in, and, yes, the food was fresh and delicious. Your posting makes me want to go back to Portugal. Now. Portugal offers some of the best birding sites on the Iberian peninsula! I can confirm that João Jara of Birds and Nature (Portugal) is a very easy person to get on with and certainly has an immense knowledge of the birds and wildlife of the country. We recently worked together and I would certainly recommend using his company. You won’t be disappointed! How do I get from <Lissabon to Noudari the easiest way without possessing a car?